Southern Syrian neighbor is Israel. De jure, both countries are at war, as the peace treaty between them after the 1967 war wasn’t signed so far. According to the Knesset, the Israeli parliament, Syria is defined as an "enemy state". People can’t visit it without a special permission. An illegal entering Israel territory is punished by imprisonment. But the illegal entering from Syria is an aggravating circumstance and is punished harsher. The laws ban any trade relations with the country. 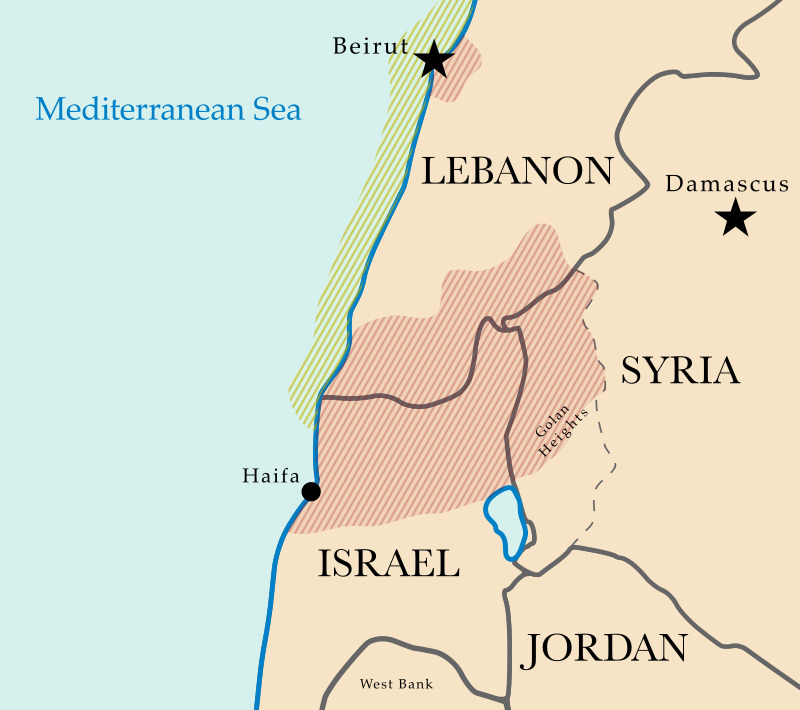 The territorial dispute between Israel and Syria is the Golan Heights. Before 1967 it was a Syrian region. After the Six Day War, in which Israel won, it was declared as demilitarized zone. However, in 1981 the Knesset, despite UN resolutions, declared its sovereignty of the territory, annexing it, in fact. Why? It is strategic heights where a huge part of Israel is exposed to fire. Israel's population is 8.3 million people. The fifth part of population is Arab, national minorities – 4.5%, some of them are Druzes who also live in Syria. By the way, after the Six Day War, women were allowed to marry Syrian citizens and move there. However, they get only one way ticket. Syria openly supports Palestine that, naturally, irritates Tel Aviv. In 2010, the camp on Yarmuk, the territory of the Arab Republic, hosted about 160 thousand Palestinian refugees. Syria sent humanitarian deliveries for the partially recognized country. However, two years later the Islamists seized the camp. Its isolation caused the deaths of dozens of people. Humanitarian deliveries came under fire. Despite the inability to provide real assistance, the Assad government favors the efforts of the Palestinian Authority through the UN Security Council to get the status of the country. Israel does not interfere in the Syrian conflict openly. But in response to last week accident when some Syrian missiles had fallen in the Golan, Tel Aviv quickly responded firing two ammunition depots of the Syrian army. Israel is so tenacious of the Golan not only because of its strategic location. Now the region provides a significant part of the fresh water. Tel Aviv is motivated to strengthen its position there as some oil and gas resources were discovered this year. The Exploration was carried out not only with the Washington arrangement, but with the participation of Afek Oil, the US company. The discovered resources are not only enough to cover all domestic needs, but also to make Israel a hydrocarbons exporter. The United States has always been a strategic partner for Israel, but its foreign policy in the Middle East is conducted according its own national interests, so it can disagree with the USA on some issues. Netanyahu found out about the Russian operation in Syria at the Moscow meeting with Putin on 21 September, that mean’s even before Obama. However, until now the head of the Israeli did not make any statement condemning the bombing of the ISIL by Russians, and other terrorists. So, under the circumstances, the country prefers to wait. The conflict with Syria, Palestine and other Arab states has no acceptable solution for all parties. It is a question of the existence or the destruction of one of the country. So, Israel fully controls the Golan Heights and removes Arab settlements on its territory, or the Arabs throw Israel into the sea and completely eliminate its occupation statehood. Other decisions are not satisfied the conflict parties. But it is evident that the Syria war is beneficial to Tel Aviv. As Assad, being busy keeping its power, can’t have any political influence on Israel geopolitical interests, which includes not only Palestine, but even Lebanon. The Arab Republic can’t prevent the production of hydrocarbons in the Golan too. So while Syria being in total chaos, Israel can make more profit.